September 12, 2018 (Investorideas.com Newswire) Rudi Fronk and Jim Anthony, cofounders of Seabridge Gold, discuss the factors that they believe could cause a powerful rally in gold. Positioning, sentiment and market structure favor a powerful rally in gold. The COTs released by the CME on September 7, 2018, show the gross speculative short position grew 1.3% to 213,259 contracts, just shy of the all-time record set two weeks ago. 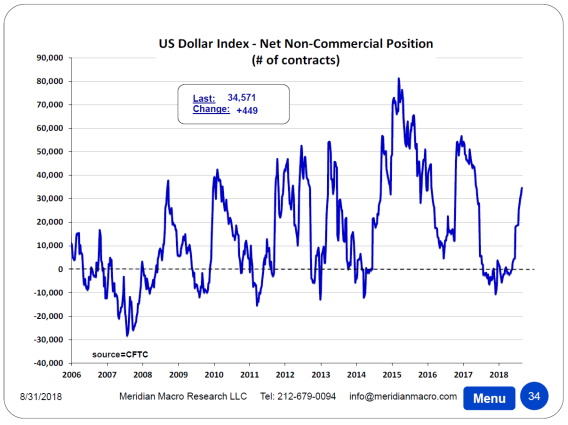 On a net basis, speculators are short 13,500 contracts, the largest short position since December, 2001. Nonetheless, gold continues to look weak, largely the result of a stronger dollar and market expectations of further dollar strength, which is putting pressure on gold, commodities and emerging markets currencies. Not surprisingly, speculators have been crowding into the dollar. There are four main reasons why the dollar looks to go higher despite U.S. political uncertainty, growing deficit spending and a worsening trade balance. Each of those reasons may prove to be short-lived. First, U.S. dollar-denominated debt offers higher interest rates than the debt of other developed economies, especially euro debt, which has attracted funds into the dollar. The key comparison here is the yield on the German 10-year note compared to its U.S. counterpart. Over the past year, the yield gap has widened in favor of the dollar until June when the trend has stalled, reflecting a 50% cut in bond purchases by the European Central Bank and an expectation that ECB buying will come to an end this December. If true, EU debt will fall (yields will rise) as the biggest and least price-sensitive purchaser stops bidding. We expect the yield gap will likely close. The second main support for the dollar is the market's perception of the U.S.-China trade war. In a nutshell, the market sees China and the Chinese economy as the losers while Trump and the U.S. economy are perceived to be winners before any serious damage is done to the U.S. economy and corporate earnings. Every time Trump implements a new set of trade sanctions, the dollar rises while the yuan, commodities and gold fall. This pro-dollar trade will unwind when markets begin to conclude there is no easy, early victory. We think this may be imminent. America's largest companies are now warning that Trump's trade policies are beginning to cut into their business prospects and many are reporting serious upward pressures in pricing due to the tariffs and their disruption to established supply lines. Third, the U.S. has had the best performing stock market on the planet for the past two years, which has attracted global capital to the dollar. U.S. corporate earnings are up strongly, in part because of the magic of share buy-backs but also because of the pro-business policies of the Trump Administration. Regulations have been reduced and taxes have been cut. We think the tax cut has produced a "sugar high" but its effect is already wearing off. Meanwhile, mid-term elections are fast approaching and there is a real possibility that Republicans will lose control of the House to increasingly "progressive" Democrats, effectively ending the Trump effect. U.S. political uncertainty, growing deficit spending and a worsening trade balance may then begin to matter, all to the detriment of the dollar. Fourth, in our view, the dollar still depends primarily upon one thing…the perception of Fed policy. The Fed is tightening, steadily raising short-term rates and selling assets into the market for dollars it then extinguishes. The latter initiative will shortly reach its objective of removing $50 billion per month, a level the Fed has said it will maintain for years to come. The key question for the dollar is whether the Fed stays the course. The market assumes it will. We are less certain. We believe that Fed tightening will break the stock market and cause a reversal in Fed policy, which will have a dramatic impact on the dollar and gold. But especially, watch the Emerging Market currency implosions that now threaten more than 20 countries ranging from Turkey, Argentina and South Africa to Poland and Brazil. This growing crisis is directly attributable to Fed tightening thanks to the fact that Emerging Markets have incurred more than US$3.7 trillion in dollar-denominated debt. None of these economies may be big enough to matter in a global context but their impact on the global banking system may be another matter.